The four Franco brothers, who were draymen: the wool-comber Benito Garcia, a baptized Jew, who had traveled a great deal; and John de Ocaña; also five Jews: Ça (Isaac) Franco, aged 84 years, formerly resident in Tembleque and afterward in Quintanar; his two sons, Mose and Yuce Franco, the latter a shoemaker in Tembleque; David de Pereyon, a poor man in La Guardia, who appears to have had charge of the ritual ceremonies in the little community; and the Tembleque physician Maestre Yuce Tazarte. The accused were arrested by the Inquisition in 1490, either in Segovia or Astorga, and were summoned before the tribunal at Avila. The physician Yuce Tazarte, Mose Franco, and David de Pereyon died before the beginning of the trial, which lasted from Dec. 17, 1490, to Nov. 16, 1491, and terminated with the condemnation of the accused. The chief witness was Yuce Franco, a young man hardly twenty years old and of limited intellect, upon whose testimony the tribunal laid especial emphasis—all other testimony in the case has been lost or destroyed. Another interesting character in the suit was Benito Garcia, who had been baptized when he was forty, but soon repented his apostasy and returned to Judaism. The confession of Yuce Franco, either voluntary (as was pretended) or forced (through fear of martyrdom and the application of torture), showed that the accused had crucified a child at night in a den situated on the street of La Guardia; that they had put a crown of thorns on his head, opened his veins, caught his blood in a basin, and then torn out his heart with imprecations upon Jesus. Thereupon they were said to have taken the dead child from the cross and to have buried him the same night in a place which could never be found again. Some days later the same persons again gathered at night in the same den to utter curses and, with the assistance of the physician Tazarte, to practise magic by means of the child's heart and a consecrated host. The object of these charms was to bring about the death of all Inquisitors and Christians, to destroy the Christian faith, and to make the Jewish faith prevail generally. Since the charm had no effect, the conspirators met a third time, and sent Benito Garcia with the child's heart and a new host to Rabbi Moses Abenamias in Zamora and to another rabbi of that city, in the hope that they might be more successful in their witchcraft. This was the crime laid to the charge of the Jews and Maranos. The accused and the witnesses, who were heard separately by the Inquisitors without being brought face to face, contradicted one another in regard to the age of the child, the names of his parents, the place of his birth and residence, and the place where the crime was committed. 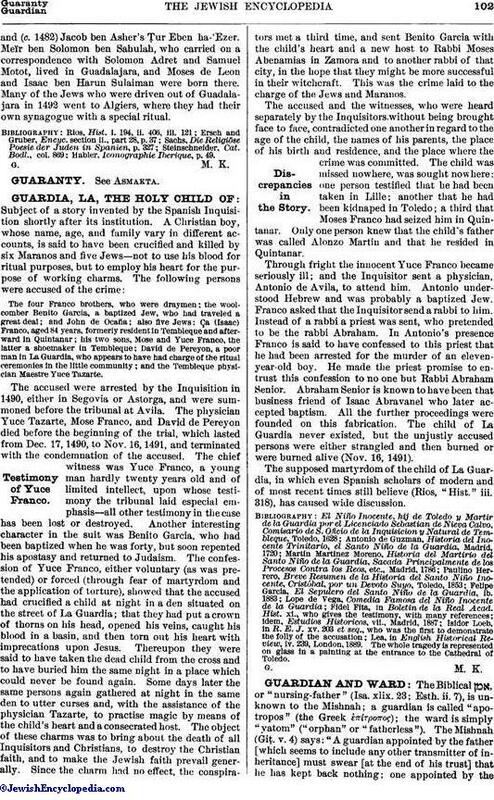 The child was missed nowhere, was sought nowhere: one person testified that he had been taken in Lille; another that he had been kidnaped in Toledo; a third that Moses Franco had seized him in Quintanar. Only one person knew that the child's father was called Alonẓo Martin and that he resided in Quintanar. Through fright the innocent Yuce Franco became seriously ill; and the Inquisitor sent a physician, Antonio de Avila, to attend him. Antonio understood Hebrew and was probably a baptized Jew. Franco asked that the Inquisitor send a rabbi to him. Instead of a rabbi a priest was sent, who pretended to be the rabbi Abraham. In Antonio's presence Franco is said to have confessed to this priest that he had been arrested for the murder of an eleven-year-old boy. He made the priest promise to entrust this confession to no one but Rabbi Abraham Senior. Abraham Senior is known to have been that business friend of Isaac Abravanel who later accepted baptism. All the further proceedings were founded on this fabrication. The child of La Guardia never existed, but the unjustly accused persons were either strangled and then burned or were burned alive (Nov. 16, 1491). The supposed martyrdom of the child of La Guardia, in which even Spanish scholars of modern and of most recent times still believe (Rios, "Hist." iii. 318), has caused wide discussion. Lea, in English Historical Review, iv. 239, London, 1889. The whole tragedy is represented on glass in a painting at the entrance to the Cathedral of Toledo.